New 2012 SG "Concise" Catalogue. 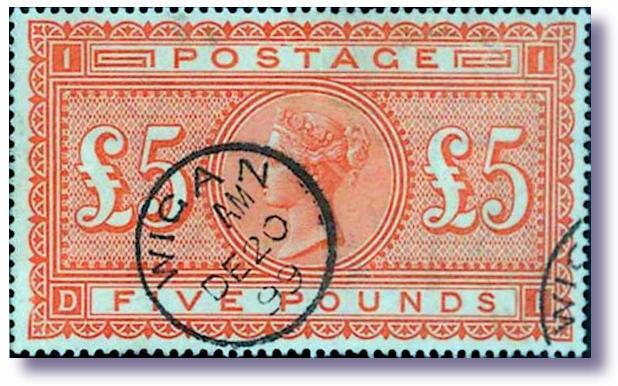 GB 1864 Plate "77" used stamp sells for £550,000. Eagle-eyed collectors have been making good money spotting interesting errors on the current "2nd Class" QE2 Machin stamps. Some of them were printed with the security background wording reading “ROYAL MRIL” instead of ROYAL MAIL. This is a VERY common stamp in kiloware, and the error is pretty easy to spot. Current price on ebay now is about £50 each, and they were well into the £100s each until recently. Find a MINT one and I can offer you VERY big money for it! 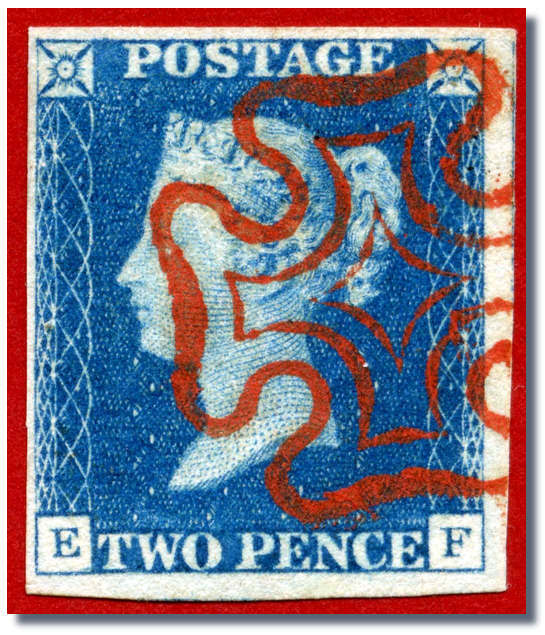 As most readers will know UK are now releasing most new Machins in a new style - each with two or four “U” shape slits in each stamp as illustrated nearby. The idea is, it is impossible to peel these off an envelope that has not been cancelled, and then re-use them again on the mail. The official explanation is that this will: "act in the same way as retail price stickers, causing a stamp to rip if you try to pull it off an envelope." 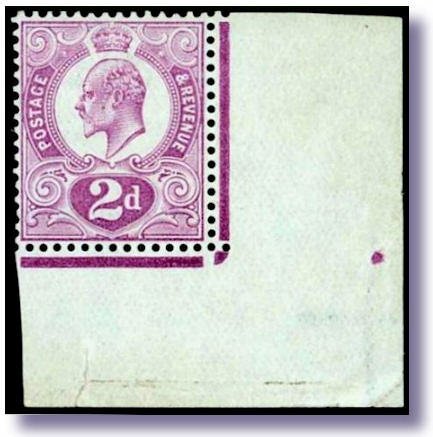 The “ROYAL MAIL” overprint is in a semi-visible layer, more obvious as the stamp is slanted against the light - as with phosphor bands. However on the Queen's head, the words are smaller, and are 'positive', i.e. there is an area over the head which has a clear background, with the words printed in it. A Stampboards member reported latter May he found one with the top section of the security print missing. It is shown nearby in 2 scans to show the error front on, and obliquely. I predicted it is a £100 item if sold now, as other GB specialists on the board discussion had not seen or heard of this one. These new "SLITTED" stamps were first released in the UK on February 17, 2009. All allegedly have non-soakable PERMANENT adhesive on them, although it appears not as robust a glue as the USA gum. The "Machin" series has been issued for 45 years now, the first tranche being released in 1967 – the Queen’s head design being approved in 1966. As a testament to the remarkable vanity of our Monarch, Lizzy has magically not aged a single year since then, nor added a wrinkle – the exact same portrait being used now as in 1967. I'd hate to think how many denominations and colours they can be found in, and how many billions have been sold. Certainly they exist from ½d to £5 - and masses of values in between. Then you can add endless specialised variations - with various phosphor bands, shades, papers, printers, elliptical perfs and the like, to the list as well. 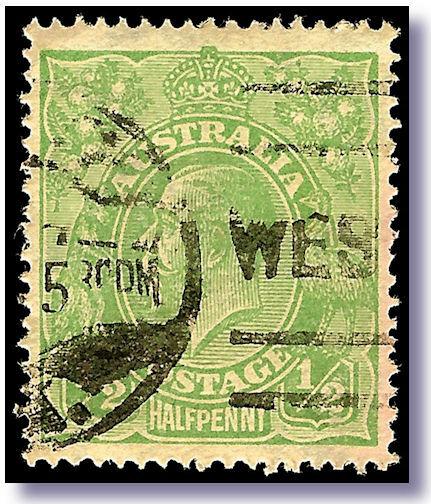 Phoenix Auctions Melbourne will offer this ½d green Sideways Watermark KGV head on June 9. One of the great Australian watermark rarities, this example turned up in a cheap kiloware/bundle estate lot, they reported on stampboards. The way out-dated ACSC catalogue value for this is $A40,000. I have little doubt it will fetch that kind of money, or more, as it is the finest of the 3 known. Perfectly centred, it has a Western Australia machine roller cancel. 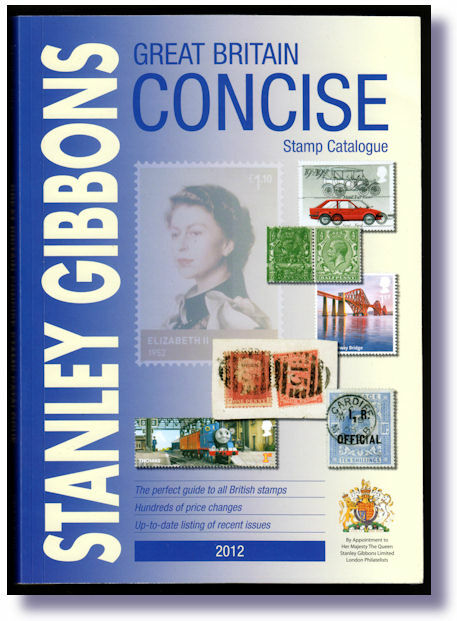 The new Gibbons 2012 GB 'Concise' catalogue has just been released. If you collect or stock pre-war GB you MUST get a copy, or you will be way behind the market on prices. Hugh Jefferies and Vince Cordell are the lead Editors of this huge full colour opus, that is now over 400 pages thick. Australia RRP is just $A54, and I sell a lot each year. UK retail is £30 so the local price is most attractive, as they are heavy to mail. Values of the TOP END GB material are up strongly right across the board. Update your old copy NOW! Indeed the entire pre 1920s era seems to have an upward price tick on near every item I looked at. Starting right from the basic 1840 1d Black, which in the very cheapest plate is up strongly to £12,000 mint and £350 used. The scarce Plate 11 is now £4,500 used – up £500. I know a local dealer who sold SIXTY 4 margin “1d Black” copies last week, before the "new" prices were known to him, who will be VERY annoyed with himself! The 1840 2d blue is also up by £3,000 mint to £35,000, and up £150 to £850 used. And if you think that is “high” - unusually nice used copies can sell for about 4 times catalogue price, like the example shown nearby sold by UK dealer Mark Bloxham. Retail was FOUR times full SG. And that 2d blue imperf is up to a whopping £15,000 mint and £1,500 used with Inverted Watermark. These are large rises in one year. The 1840 1d Black "VR" is up £7,000 used to £35,000 used. For a REAL one - see last month's column for the ebay idiots bidding £500 on obvious crude fakes. The rare 1864 1d Red Plate number 77 is now £550,000 - in line with the price SG claim to have sold one for in recent weeks. See story below. For the last few years this plate has been listed, but unpriced in SG for some strange reason. The 1841 imperf 1d red SG 8 cheapest type is now up to £600/£30 from £500/£25. Remember with all these prices – the SG prices are deemed to be for FINE quality copies. The often found “roughies” of all the above sell for far less anywhere. The iconic SG 121, the 1880 2/- Brown, is up to £3,800 used and £28,000 mint. This really is a scarce stamp, and very small numbers were sold. Being a “boring” looking tiny brown stamp, typically used on a brown parcel wrapper, few were kept - that much is obvious. And those that were, had those horrid super heavy 1880s era “killer” parcel cancels on them too. The 1883 “Lilac and Green” set are all up – the key 9d is now £1,200 mint and £475 used. A really hard stamp to find in good shape – about 100 times scarcer than the 6d Green, which has about HALF that catalogue value! The 1910 KEVII 2d Tyrian Plum goes up to £110,000, taking the Gibbons value to 6 times what it was just a few years back. Who said there was “no money in stamps”? Auction results support the catalogue price rise on SG 266a. An example shown nearby was invoiced for £102,000 late 2011 by Spink in London. A huge number of the KEVII 2d Tyrian Plums were initially printed - 100,000 sheets, totalling 24,000,000 stamps emerged from the presses - but today very few remain. One is known on cover to KGV. Almost all were destroyed without being issued, when Edward VII died. Only 12 are now believed to exist - three of which are in The Royal Philatelic Collection of Her Majesty, Queen Elizabeth II. The example offered in the Spink “Chartwell” Collection was a lower right corner example. With part original gum, it shows a colour dot in right margin. There were a couple of defects in this copy – a sizeable tear in the bottom margin, and a small mark on Edward's cheek near his earlobe, but it is one of the finest examples of this exceptionally rare stamp. Buy the scarce ones NOW! Many of us saw such rises happen 30 years back with each new SG Catalogue appearing, and I get a strong feeling of Déjà Vu. Mark my words - you will see this same pattern occur for several years to come in SG catalogues for early GB. The lesson? Buy the stamps you need NOW in this better grade of material. The common $5 type items will likely still be $5 in 5 years’ time. Maybe less. The $500 item might however become $1,000, and the $5,000 stamp might be $15,000. Or more. And the same money in the bank will likely to have gone up only 15% or so in 5 years. And if left in the stock-market, or traditional superannuation funds, it may well have DECREASED, as we can all see from some recent annual returns! As an example of how easy the pricier material is to sell, I have set up a “Rarity” page offering choice single items and covers priced mainly over $1,000. Shameless plug, but many items sell in a day or so of listing them – glenstephens.com/rarity.html - and other dealers report the same experience with top shelf material. The iconic £5 Orange Queen Victoria from 1882 increases of course in the “Concise”- up to £15,000 used. Being a huge stamp, finding top quality examples without faults has always been hard. Did you realise that no POSTALLY used examples of this are believed to exist? As chance has it, I had a UK auction house owner visit me here, who has a 16 frame exhibit of the 1882 GB £5 Orange he showed me. He has one of the best showings of these stamps on earth. This is not a novice we are talking of here! NO postal used £5 Oranges? That UK dealer believes near all, if not all, the existing "used" £5 GB Oranges were NOT postally used. Even the "Registered Threadneedle Street" cancel one he has in his collection, that is illustrated on stampboards. Which he believes was used for TELEGRAM bulk lodgements there, despite the "Registered" cancel. He has never seen a £5 he is convinced has done genuine postal service of any kind. Or seen a parcel label or parcel piece even. The dealer advised me that about 15% of them he has seen, have Edinburgh, Glasgow or Belfast neat cds cancels. These were used for the collection and payment of excise duty (nearly all whisky) paid by the many distilleries in those places. All 3 fiscally used it seems! 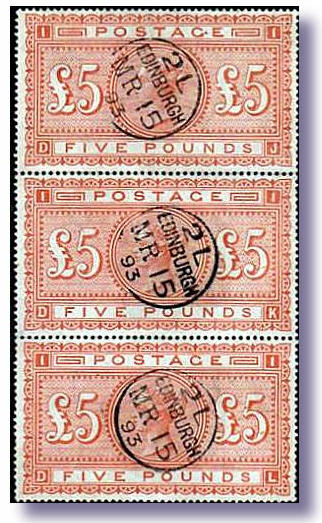 As was the used strip of 3 all used with neat “Edinburgh” cancels. Illustrated nearby from his collection – excuse the fuzzy scan. Don’t get me wrong – I’d love to have it in stock, but never knew such pretty things were fiscal used only. tinyurl.com/QV5PD contains many more images, and much discussion on this interesting topic! What is a 1d red Roo worth? The short answer is, a dollar or so in most dealer stockbooks on earth. 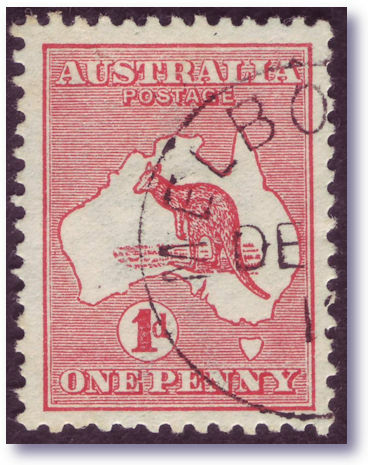 The 1d Kangaroo is a very common stamp, and well over a BILLION were used. Would YOU pay $90 for this? The example shown nearby has no special die or watermark or plate varieties - it is catalogued in Stanley Gibbons at just £1 used. Not always so. The example shown nearby sold for $A90 on ebay in mid-April, and 2 very experienced collectors were bidder and underbidder. Both are active stampboards members, and the funny thing is if a dealer offered it for $80 nett, neither would have bought it I suspect! Ebay fever. Seller “1915cazna” is one of a few ebay stamp sellers who does not get immersed in the absurd BS and hyperbole many use, and oddly his results are better. Lesson learned for some ebay sellers. Less is often more. The lot number was 270949528778 and there were 11 bids. tinyurl.com/RooCTO is the web link to that, and much has been uncovered and reported much there that was not previously recorded in print. The Journal of the ACCC has recently had 2 articles from Geoff Kellow that adds to the interest in this field not otherwise studied much by collectors. Arthur Gray was kind enough to bring over his CTO Kangaroos recently, and I scanned and posted up all pages of his collection. Much unique material is among it. 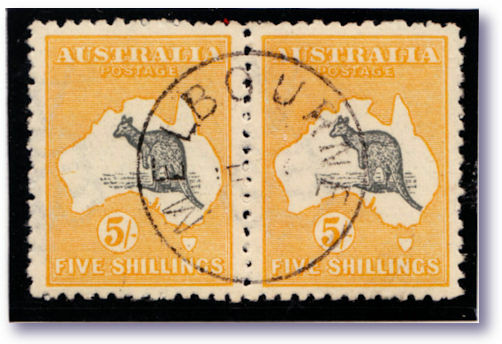 Shown nearby is a 5/- Kangaroo 1915 "Second Watermark" (SG 30) pair from Arthur's collection. Until sighting these I had never believed this watermark received the special "CTO" cancels - they clearly did. The ACSC note on these is a little outdated now that this pair is recorded. Make a VERY large cup of coffee to read all the 2000 messages, and accompanying photos! The “AP 15 – 13” crisp cancels are developing quite a cult following. Very much scarcer than the “DE 3 – 13” cancels shown on the 1d Roo above. More on them, and more great photos in a future column. A single example of the elusive 1858 GB “Plate 77 Penny Red” has just been sold by Stanley Gibbons in London. The company has announced its sale to “a private client in Australasia” for £550,000. SG were not prepared to give me a specific country of residence when I asked. I have it on very good advice that the buyer was Sir Ron Brierley, well known business figure in Sydney, and a recent owner of Stanley Gibbons Auctions in Australia. It was sold just two months after SG acquired it. The stamp was described as “the finest used example in existence, inside or outside a museum” by the Stanley Gibbons Director of Great Britain Philately. The acquisition of the stamp attracted much media attention in the UK, being featured on the BBC website etc. 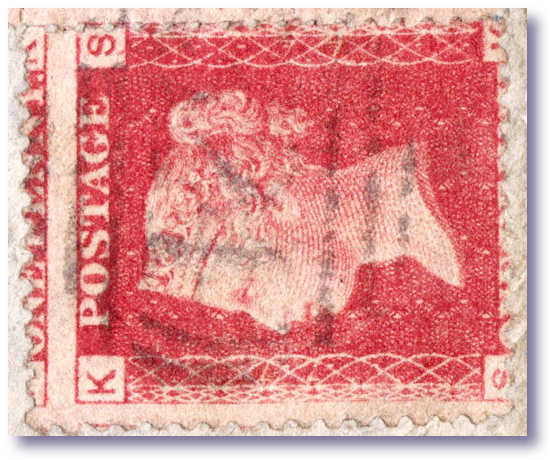 Its appearance on prime time television was heralded as, “a coup for the hobby” in the philatelic press. Great stuff! The buyer, who wishes to remain anonymous, purchased the Plate 77 Penny Red through the company’s recently opened Hong Kong office. Of the four mint examples recorded, one is in the Royal Philatelic Collection, one in the Tapling Collection in the British Library. Another was in the “Raphael” collection that was stolen in 1965, and has not been seen since. The fourth was in the famous Ferrary collection that was sold in the 1920s - the authenticity of that has never been confirmed, and again has not been seen since the auction. 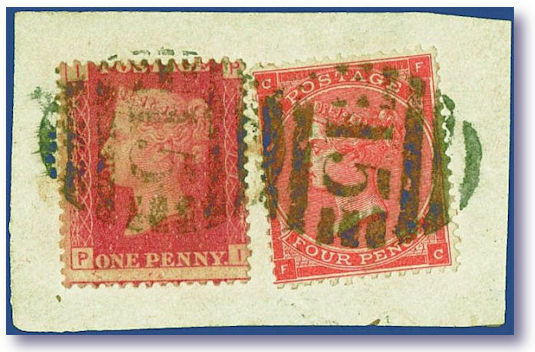 Of the five “accepted” used examples, two damaged examples were found in the early 20th Century, neither of which has been seen on the open market for over 50 years. A third was in the "Crocker" collection and lost in the 1906 San Francisco Earthquake, and a fourth example from the "Adams" collection is now in the British Library. A fifth example is the one offered for sale by Stanley Gibbons for £550,000 and is stated to have recently sold for that figure. An un-resolved discovery of this stamp was made a few years back, that I personally believe to be 100% genuine. The discovery was of a 1865 part cover from Guernsey to Brussels Belgium, in an old collection job lot in Europe, where the scarce plate number had not been recognised. 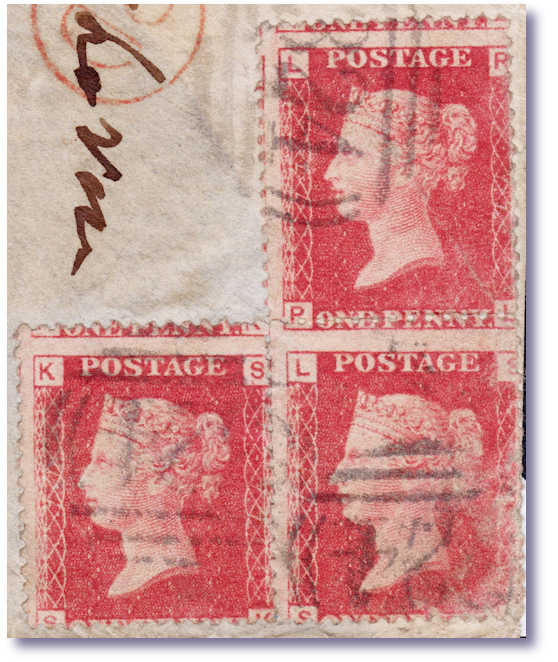 The cover was pre-paid with 3 x 1d red stamps, all dreadfully centred, with the Guernsey "324" barred numeral obliterator. One of those is very badly scuffed, and one is creased. A rather ugly piece, value in normal circumstances - a few dollars on a good day. However all stamps are showing Plate “77” on both sides – making this a literally £100,000s rarity if finally certified genuine. Indeed arguably a 7 figure piece based on the SG recent sale of £550,000 for a single. No forger would have worked tirelessly on 3 stamps when 1 was normal, and choosing a ratty cover and damaged stamps is not any forger’s path. The stamp world has changed, and stampboards may have unveiled the greatest stamp discovery of this century. All essentially due to a long and detailed discussion on the internet Stamp Bulletin Board. There are 100s of detailed colour photos, and charts and graphs, and large blow ups, and whereabouts of the other known existing plate “77’ examples. All added by members all over the globe. tinyurl.com/plate77 caries the complete discussion, which to date is some 1,200 different messages, with about 50,000 page views so far. A decade back this discovery would have appeared as a mention in a specialist journal somewhere, a letter or two in response might have been published, and the matter then consigned to the dustbin of history. “Alleged cover bearing GB plate 77 stamps is rejected as forged” etc, and case closed. However the 8500 stampboards members voted this as their favourite discussion thread of all time, as it may well be history in the making. One member “stampmann” (Grahame Mann) from Torquay UK who is a long experienced specialist dealer in GB 1d Plate numbers reports he also found a “77” cover in recent years, and also got a “bad” certificate. He knows his stuff backwards, and felt sure he had the real McCoy and a plate 77, (E.I.) but dejectedly sold it for £1½d at Stampex described as the plate 73 that he was advised it was by the “experts”. Understandably he is now furious he sold it for a song, and did not back his better judgement that it showed 77. The trio on cover saga however, has soldiered on substantially since my last mention. The two initial “Certificates” decided the 3 stamps on cover were NOT bearing Plate ‘77’ stamps. Like many major stamp discoveries, the stamp establishment is never terribly keen to accept on face value, something clearly very valuable, they did not know existed before. Most especially in the ultra conservative British stamp world. The RPS London’s view was plainly absurd, arguing essentially that someone had cut the number “7” out of other stamps, and pasted it over the second “7” on each stamp on the cover. A basic $20 UV lamp would detect that if it were true! As would 20/20 eyesight I’d guess, or a human fingernail. The other Philatelic Foundation (PF) view in essence imputed the second original number had been hand-painted out in red, and a new 7 in white painted in on every stamp. Again the most rudimentary of checking would reveal this, if it were the case – and if it were possible to do. The UK owner Abed Najjar was not satisfied with these clearly sloppy opinions, and commissioned a raft of University and forensic lab reports on the cover. 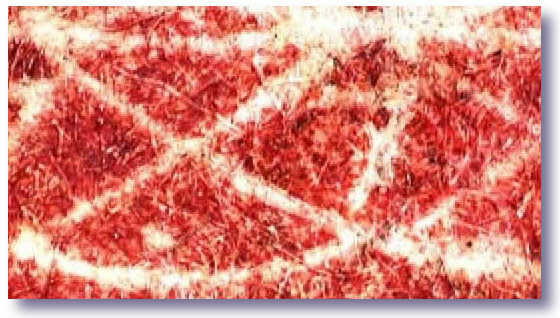 As you will see in the highly detailed reports here – tinyurl.com/AbedNaj - senior forensic Scientists and technical labs, using electron microscopes, and a million dollars of analytical equipment, see no evidence whatever of faking or alteration. Najjar spent £10,000’s, and a great deal of time, and went out and got those highly technical forensic reports on this cover. The detailed forensic evidence appears to clearly show those "Expert" views above are simply wrong. However after the initial discussions on stampboards, Najjar further commissioned Robert Radley, a leading paper and forensic expert to take the specific RPSL and PF “opinions” and analyse them point by point. 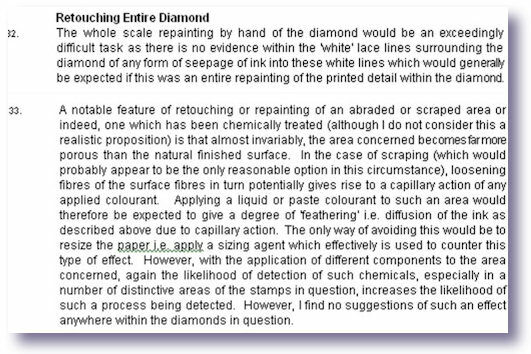 Point 33 of the long forensic report is shown nearby, and a massive close up of one of the “7” diamonds. YOU be the judge! This super detailed Radley report is found on - tinyurl.com/radleys and is well worth a close read. In summary this expert showed that both the “Expert” opinions were total nonsense, and were not supported by a shred of scientific or forensic evidence. And make no mistake, the writer of this report condemning both Certificates is a world leading expert, and has often tendered forensic paper evidence to courts on a very wide scale. If this was a Court Of Law, the RPSL and PF views on this cover, would be tossed out unceremoniously in my view. The opinion appears to be that there was an emergency and short lived substituted cliché or repair or similar. Done for whatever reason, on one of the plates, leaving some units showing Plate 73 corner letter characteristics, but showing “77”. The Jury is still out on this interesting cover. tinyurl.com/plate77 is a truly fascinating read. As I often type – “the last word is NEVER written in Philately” ! Get my regular market update emails FREE. Stamp gossip, price trends, record sale prices, and many one-time stamp specials, wholesale bargains, and exciting offers and breaking philatelic news. A mini stamp magazine in every email! "KNOWLEDGE IS POWER". The ONE stamp list you MUSTf be on, to keep in touch with the rapidly changing world market. One client made $65,000 profit in a few months after following my specific advice. Sign up securely and quickly by clicking HERE to access my automated data base. hhhhhhhh And whttp://www.iser still ADD your home AND work email, if I only have one right now. Add a stamp friend's email address if you wish. One short click and you are subscribed to probably the most read email list in the stamp world!